Superflow GWS Tank Selangor, Malaysia, Kuala Lumpur (KL), Rawang Supplier, Supplies, Keylargo Industrial Sdn. Bhd. Superflow tanks are ideally suited for applications where high-pressure ratingsare required. These applications include booster systems, heating expansion and hammer arresting in high-rise and multistory buildings such as hotels, hospitals or business centres. 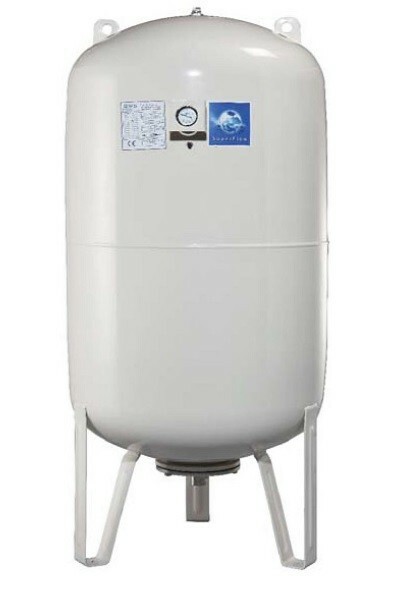 Superflow tank range from 8 to 10,000 litres and are available in 10, 16 and 25 bar pressure ratings which makesGWS one of the most comprehesive suppliers globally. The interchangeable membrane design of the tanks allows you to replace the membrane whenever required, and the built-in pressure gauge, starting at tanks of 100 litres size, make the system-pressure control as easy as possible. Superflow series vessels are quality checked at several stages during the production and given regular maintenance, we recommend pre-charge check every 3 months, these vessels represent the best value for the investment and are designed to serve your needs for years to come.